Aars, Jon, ed. (2005). Polar bears : proceedings of the 14th Working meeting of the IUCN/SSC Polar Bear Specialist Group, 20-24 June 2005, Seattle, Washington, USA. ISBN 978-2-8317-0959-8. Bruemmer, Fred (1989). World of the Polar Bear. Toronto, Ontario, Canada: Key Porter Books. ISBN 978-1-55013-107-9. Hemstock, Annie (1999). 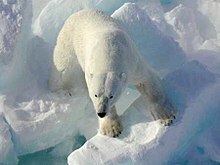 The Polar Bear. Manakato, MN: Capstone Press. ISBN 978-0-7368-0031-0. Lockwood, Sophie (2006). Polar Bears. Chanhassen, MN: The Child's World. ISBN 978-1-59296-501-4. Matthews, Downs (1993). Polar Bear. San Francisco, CA: Chronicle Books. ISBN 978-0-8118-0204-8. Rosing, Norbert (1996). The World of the Polar Bear. Willowdale, ON: Firefly Books Ltd. ISBN 978-1-55209-068-8. ^ Molnár, Péter K.; Derocher, Andrew E.; Klanjscek, Tin; Lewis, Mark A. (2011-02-08). 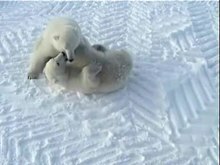 “Predicting climate change impacts on polar bear litter size”. Nature Communications (Springer Nature Publishing AG) 2. doi:10.1038/ncomms1183. https://www.nature.com/articles/ncomms1183 2019年1月20日閲覧。. ^ Graham J. Slater; Borja Figueirido; Leeann Louis; Paul Yang; Blaire Van Valkenburgh (2010-11-05). 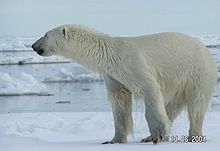 “Biomechanical Consequences of Rapid Evolution in the Polar Bear Lineage”. PLoS ONE 5(11). doi:10.1371/journal.pone.0013870. https://journals.plos.org/plosone/article?id=10.1371/journal.pone.0013870.